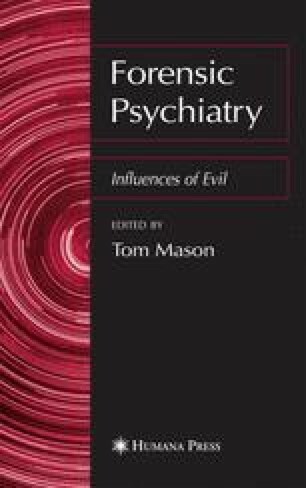 This chapter reports on research carried out in a high-security psychiatric establishment in the United Kingdom. Data were collected from primary nurses and care plan documentation on patients who were considered to be evil. The results indicate that nursing staff employ medical discourse in an attempt to understand index offenses up until they consider the patient’s actions evil, and beyond help, then they employ lay language as a means to understand such behavior. The care plans reveal a lack of cohesive treatment strategies regarding this group of patients and suggest an absence of credible therapeutic approaches. A model of motivation is set out in which, depending on the nurses’ interpretation of the patient’s ability to manage the values underpinning right and wrong, their free will, and their subsequent choice of action, they can be located as Akratic, Brutish, or medical forms.